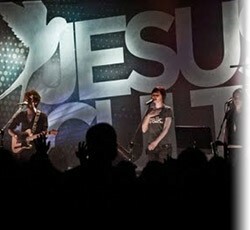 In the summer of 1999, the youth group led by Banning Liebscher at Bethel Church in Redding, CA, launched the first Jesus Culture conference. The heart of these gatherings was to serve other churches and lead young people to experience the radical love of God. A few years into hosting conferences at Redding, the Lord began to speak to us about a new breed of revivalists that were emerging throughout the earth to answer the cry of God’s yearning for nations. Our mandate was defined: to raise up, mobilize, equip, encourage, resource, and send these burning ones to fulfill the call of God on their lives, and see entire cities saved, campuses revolutionized, and nations discipled. In response to our mandate, Jesus Culture Music and Campus Awakening have been inspired and birthed out of Jesus Culture.